Area III covers Blount, Cocke, Hamblen, Jefferson, Knox, Loudon, Monroe, and Sevier counties--a piece of the eastern border of Tennessee where it borders North Carolina. 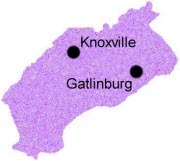 The clubs in Area III belong to the Council of East Tennessee Square and Round Dance Clubs, Inc. (CET). CET also provides services for the clubs in Area IV. CET publishes a quarterly newsletter called DanceData which is available from their website by clicking on the Dance Data Newsletter link. In addition to local dance news, it has a schedule of dances. Area III clubs are listed below. Check their websites (where available) or call or email the contact to ensure the dance has not been cancelled for some reason.